Liverpool extended their lead to five points at the top of the table on Wednesday night after a 1-1 draw with Leicester, but the match is tinged slightly with the knowledge the Reds could have been a massive seven points clear. Rafa Benitez had picked up a win over Manchester City the evening before, much to the delight of Kopites and so Wednesday’s clash proved to be a huge opportunity for Klopp’s side who, on paper, should have beaten Leicester. The Reds started brilliantly with a goal after two minutes thanks to Sadio Mane. The forward slipped his effort through the sleet and sent Anfield wild. It all started so well and it was Liverpool who retained control for the majority of the first half. That was until Harry Maguire netted right on the stroke of half time. The chance came from a free kick which Liverpool somewhat foolishly gave away, with many blue shirts offside Maguire timed his move perfectly and created a big problem for the Reds with his equaliser. In the second half, I think Liverpool began to fracture slightly. Anfield was tense, the players are obviously aching to get a goal but in difficult conditions, it just didn’t seem to be happening. Hilariously the Liverpool ground staff spent the whole of half time clearing only the Kop End of the pitch, unfortunately, it didn’t really seem to have an impact. The Reds could have had a chance to win it when Naby Keita was brought down in the box. It was definitely a penalty in my opinion and while I try not to dwell on decisions that could prove to be a massive call for the Reds who are chasing down their first title in 29 years. While Liverpool had their chances, Leicester did too. A decision from Demarai Gray to strike instead of square probably kept Liverpool in the game, I am certain if Gray had passed that would have been 2-1 to the foxes. At one point Bobby Firmino also very nearly turned the ball into his own net! Overall I think we simply have to focus on the positives, we’re top of the league and we’ve extended the gap to five points. Let’s face it, nobody realistically thought City would lose on Tuesday night so the fact our lead has increased should be celebrated. 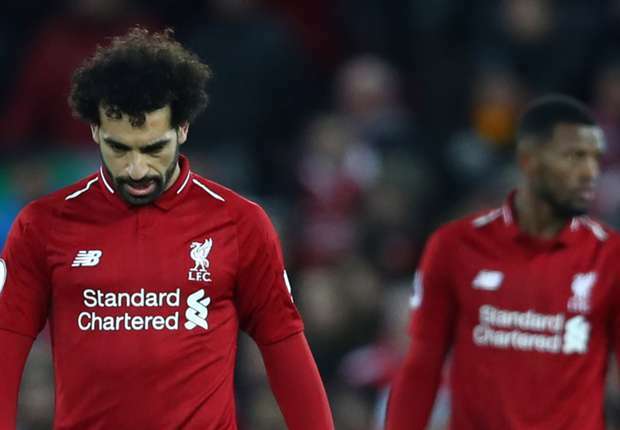 It’s such a weird phase being a Liverpool fan at the moment, you extend your lead but almost are ambivalent to the whole situation because you know from experience not to get carried away with anything.